OTTAWA — The Saskatchewan Roughriders took advantage of two early turnovers, while Will Ford had another good night rushing for 61 yards and two touchdowns as they beat the Ottawa REDBLACKS 38-14 at TD Place on Saturday night. The loss was Ottawa’s first at home this season. The evening started in a familiar way for the Riders’ defence, as the unit forced two key turnovers early on in the first quarter, one of which translated into six points. After receiver Brett Swain opened the scoring with a 25-yard touchdown on Saskatchewan’s first drive of the game, the defence went to work on establishing themselves against their opponents. First, Tristan Jackson silenced a raucous Ottawa crowd by picking off Henry Burris with just less than 10 minutes to go in the first quarter, a play that ultimately led to a 15-yard field goal by Chris Milo. Then, on Ottawa’s next possession, they ran into turnover trouble again, as Burris saw his pass intercepted by Brian Peters. The turnover proved to be a costly one for Ottawa, as the Riders went up 17-0 thanks to a one-yard TD run by Will Ford. The major capped off a five-play, 45-yard drive that saw Durant complete passes to Ford, Rob Bagg and Swain. It was not the start the REDBLACKS and their fans were hoping for, and things only get worse from that point on. Following a two-and-out on their fourth drive of the game, the REDBLACKS punted the ball to Jackson who legged out a 62-yard return, that ultimately led to Ford’s second touchdown of the game, again from one-yard out. Down 24-0 in the first quarter the REDBLACKS needed something to get back into the game, so Burris looked to his backfield partner for a spark. A 48-yard catch-and-run by Chevon Walker gave the REDBLACKS some new life nearing the end of the quarter, but the drive went no further, and the home team came away with no points, as Brett Maher missed on a 24-yard field goal attempt. The miss, however, wasn’t the first by Maher of the half, and it certainly wasn’t the most costly. Following another stalled drive by the REDBLACKS, they once again looked to Maher to get them on the board with a 49-yard field goal attempt. However, Maher missed again, allowing Jackson to return the short kick 111 yards to the house to extend Saskatchewan’s lead to 31. A rouge on the ensuing kickoff made the score 32-0 for the visitors. Looking for something to get the crowd back in the game, and hoping to do the same themselves, the REDBLACKS looked to the back pages of their playbook. With backup QB Thomas DeMarco under centre on a third-and-three situation, the REDBLACKS lined up in a shotgun formation. Rather than throwing or handing it off, DeMarco punted the ball, and the loose pigskin bounced its way into the endzone after landing just inside the 20 yard line. Then, almost out of nowhere, receiver Dobson Collins jumped into the scene and recovered the loose ball for a touchdown, the first by the REDBLACKS at TD Place. It was the first onside kick touchdown since 1999, when Calgary’s Calgary’s Scott McKenzie accomplished the rare feat. The two teams entered the break with the Riders leading 32-7. Opening the second half, the REDBLACKS were hoping to build on what seemed like a strong end to the first 30 minutes. However, the only points of the quarter came from the foot of Milo who kicked a 34-yard field goal to extend Saskatchewan’s lead to 35-7 heading into the fourth quarter. As the final frame began, the time for Ottawa to mount a comeback had almost come to an end, and with both defences continuing to take over the game there was little chance for the REDBLACKS to generate anything offensively. But with Burris out of the game, and DeMarco now under centre, the REDBLACKS offence finall found its footing. Receiver Jamil Smith and DeMarco found a rhythm, connecting on a 39-yard pass, and followed that up with a 5-yard TD connection. But that was as close as the REDBLACKS would get, as the Riders shut them down from that point on. 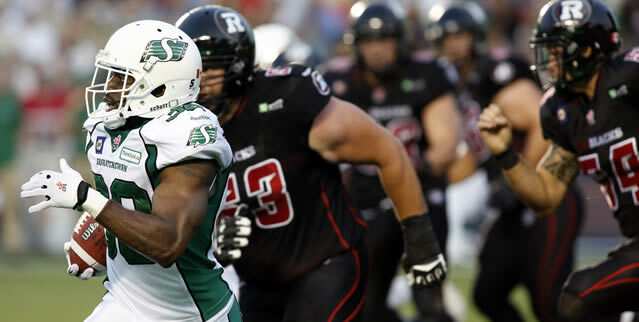 The Roughriders will look to build on their two-game tear when they travel to Winnipeg in Week 7 for an important rivalry game, while the REDBLACKS will go out West to take on the Calgary Stampeders.